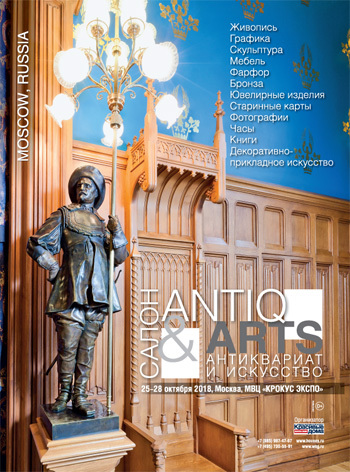 October 24-27, 2019 in the International Exhibition Center «Crocus Expo» within the exhibition «INTERIOR SALON» will be the international specialized «Antiques and Art Salon» - exposition of antique salons, art galleries, private collections and workshops from Russia and abroad, which will present works of painting, graphics, sculpture, interior and decoration items: furniture, porcelain, bronze, photographs, watches, books, maps, weapons, jewelry and valuable samples of decorative and applied art to the attention of the discerning audience. Visiting this in all respects an interesting event can be both exciting excursion and exciting shopping. Guests of the exhibition will be able to admire the old things, be imbued with the fascination of bright and amazing rarities from private collections, get professional advice and, of course, buy your favorite antiques. Participants of the «Antiq & Arts Salon» will showcase the works of famous artists, sculptors and jewelers of the past centuries, as well as the work of the best masters of contemporary art, reflecting the bright, original atmosphere of our time. WE HEARTILY INVITE YOU TO PARTICIPATE IN THE EXHIBITION IN 2019!